Col. Mark Altschuler is a licensed and bonded Auctioneer from Pennsylvania to Las Vegas. He has the highest credentials you can get including graduating from the "CAI" Certified Auctioneers Institute at Bloomington Indiana University. For over 30 years he has developed a diversified background in Auctioneering for commercial and residential auctions. Not wanting to run his own auction house, Mark is a professional bid caller. Over the last 15 years he has lent his talents to many charity and fund raising auctions including helping to raise millions for the Hollywood Motion Picture Fund. 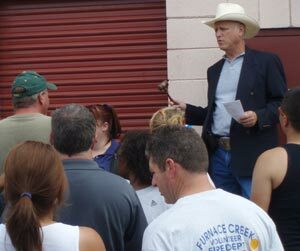 You can visit msaauctions.com for details about Mark's auctioneer services. Feel free to contact us for more information or if you would like to book Mark Altschuler for his autioneer services.